A packed ringside resulted in a cracking trade at the Suffolk Sheep Society's National Show & Sale, at Shrewsbury, on Saturday 24th July. The first main sale of the season attracted 236 entries, with forty one animals selling for four figure sums with two further lots making over 10,000gns. 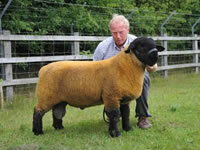 Top price of 26,000gns was paid for the Champion ram lamb presented by JG Douglas. After some furious bidding this Cairness Achievement son was knocked down to Gary Beacom for use in the Lakeview flock, N Ireland. 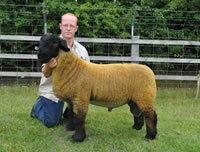 WH Sinnet's Stockton flock was one of the largest vendors with twelve tremendous lambs. Their consistency was matched with some furious bidding. 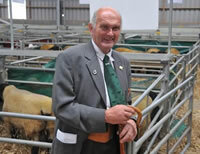 With a top call of 8,000gns for the reserve champion John went on to average 2,112gns. 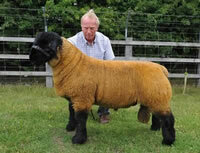 The best from G Owen's Morris flock was 4,800gns for a Plasllewelyn Pirate son. 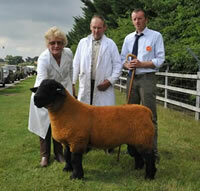 Five lambs on offer were sold to average 1,626gns. 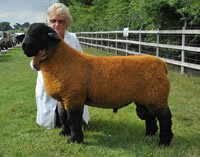 S&L Buckley's sold a Roundacre Raceway lamb for 4,000gns. 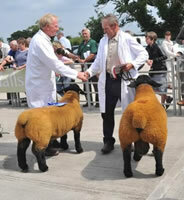 The Sitlow flock ended the day with five sold to average 1,232gns. 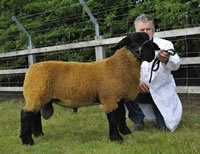 M Evans Rhaeadr flock secured a top call of 3,600gns for a Baileys Brigadier the Second son. 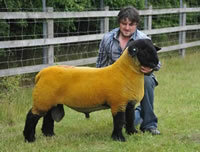 Myfyr Evans sold eight lambs sold to average 1,226gns. The Midhope flock of John Key also had a cracking trade for Signet performance recorded stock. With prices at 3,000gn and 2,600 John Key ended the day with an average of 1,232gns for five sold.